Failed events beget failed events. The less confidence a player has that your event will fire, the less likely they are to show. The fewer players show, the less likely the event is to fire—so confidence sinks further and further, taking attendance along with it. Take FNM. Almost every store in the WPN schedules it—about 90%. Thousands fire every Friday. But the number that get on the books and never materialize would make your head spin—and it could spell trouble for stores that advertise too many. This is especially true mid-season, like we are right now. This is where evaluating your event calendar and honing your advertising can help. 1. Advertise a tight schedule. An overlooked cost of failed events: any resources you put into advertising them go for naught. Every event has some risk of falling short, but you can minimize it by trimming your midseason calendar to the events you’re most confident in. You might start by whittling down to events that get support from Wizards—FNM, Standard Showdown, etc.—so that your advertising and ours are in accord. 2. Promote one event per player type per day—at most. We all know that the way an event is advertised will determine who shows up for it. The prize pool, the number of rounds, the format—the choices you make will dictate whether your event draws competitive types or folks looking for more of a social experience. Overlapping events aimed at the same audience could end up cannibalizing each other. So, on any given night, limit yourself to advertising one event at casual players (like Standard events with flat prize pools) and one event for more competitive folks (top-heavy prize pools with at least three rounds). This creates a better, more consistent experience for your players. We have a crew dedicated to making sure you’ve got the resources to advertise your Magic events effectively. 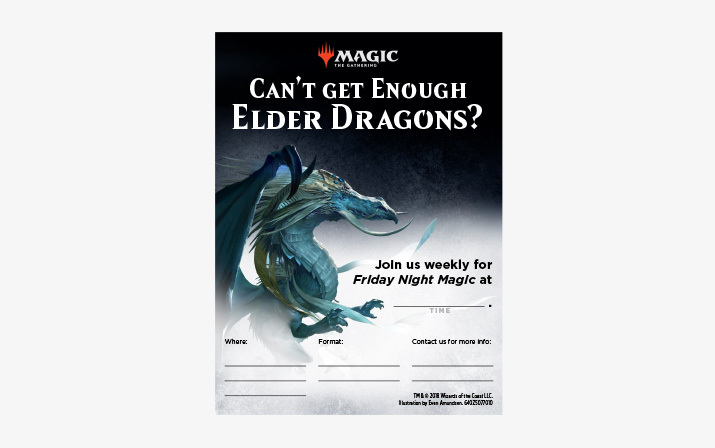 Use some of these new event accessories—like this FNM invitation—to boost your attendance mid-season. You could also consider using leftover promos from previous sets as additional prizes for folks who RSVP online or in store with the event signup sheet. Don’t get caught in the mid-season lull. Take initiative on your advertising and boost your event attendance today. How do I change the date of my event? How do I change the format of my event?